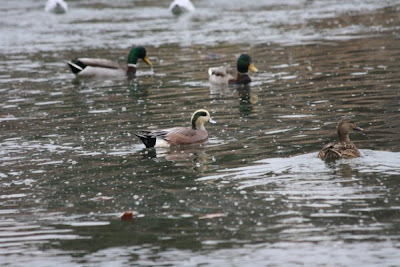 Brian Webster and Larry Flynn found and photographed this interesting drake wigeon in Norwalk, CT on Monday, Dec 7. They noticed the oddly-plumaged head and wondered if it could be a hybrid Eurasian x American, or just an aberrant American. They saw a cream-colored forehead, lower cheek, and throat. 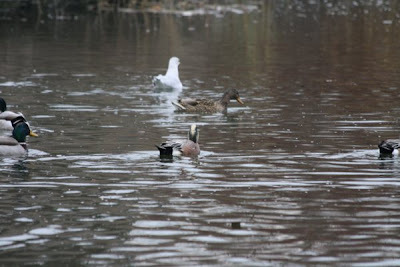 The bird also lacks much of the dark stippling that should be present on the lower cheek and throat of an American Wigeon. Also, the rear back appears to be rather pale gray in color, though this may be within range of American. Otherwise it appears fine for American. Are these interesting features indicative of Eurasian genes? I'm not sure myself, but with a gun to my head I would probably opt for hybrid over aberrant, simply because the odd features all tend toward Eurasian. I'm really not sure though; maybe it is simply a coincidence. 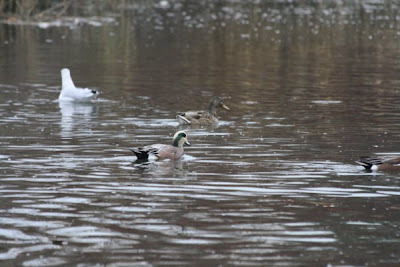 A check of many hybrid wigeon images online does not reveal a bird that looks quite like this one, so if this is a hybrid it is not a classic F1 bird. 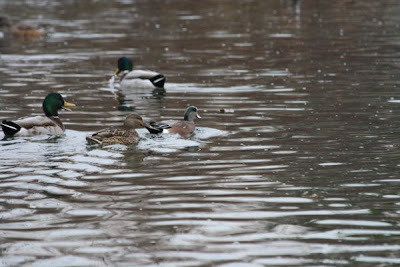 As far as published literature goes, all I could find was this article by Merrifield regarding hybrid wigeon in Oregon. Kudos to the guys for noticing a subtly different bird. I have posted the images here for Brian and Larry. If you have any thoughts on the bird, please let us know. Thanks! I've heard of a few more cases of this as well. My inclination is that they're "just" Americans, as they don't seem to show up any more often in areas where hybrids are regular. I see these often in NY; they are usually <1% of adult males, but most big wigeon flocks (there are often flocks of 400-500 at Montezuma NWR) will have several. 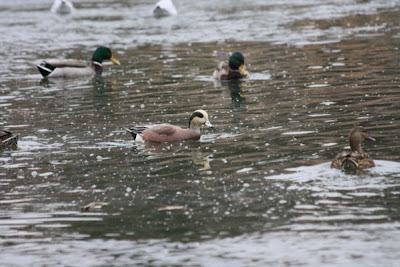 I think they are just interesting American Wigeons - some people call them "sweet cheeks". Thanks for taking the time to post to you blog, Nick. 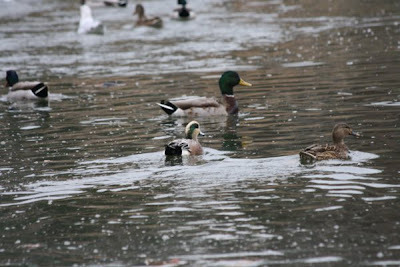 Doesn't illustration 'A' in the link you posted look like Larry and my wigeon?? I guess there really is no way to know for sure. At least I finnaly found a bird worth talking about!!! Next on the list... Lazuli Bunting!! We had a couple of these in RI two winters ago, and there was a bit of discussion on their ID then. The conclusion, whether right or not, was simply abberant Americans, but I am having trouble finding the email thread anywhere. 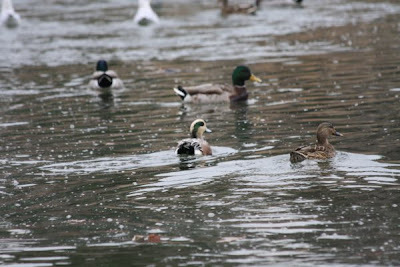 Any sort of odd-plumaged waterfowl is cool, nonetheless.